December 5, 2018 (West Chester, PA). 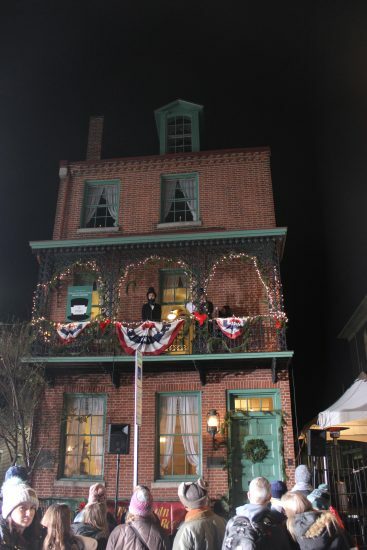 The place to be before the West Chester Holiday Parade last Friday was the Historic Lincoln Building. The 20th Annual Gettysburg Address Contest included seven middle school students from local West Chester schools. Amongst friends, family and parade goers below, the little Lincoln’s proudly recited the Gettysburg Address from the top of the Lincoln Building balcony. The event recognized and celebrated the 155th Anniversary of the Gettysburg Address and the 20th anniversary of the local competition. Hosted by the Chester County Community Foundation and the Historical and Architectural Review Board (HARB), “each student did a great job delivering their speeches” commented Bob Gross, event founder and Joe Martino, event organizer. Louise Sims from Fugett Middle School, Dharshini Saravana from Fugett Middle School, Liam Mullin from Saints Peter and Paul School, placed 1st, 2nd and 3rd respectively. Additional contestants, Lila Rose Ramirez-Gabr from Saint Agnes School, Ava Felsenfeld from Fugett Middle School, Max Moak from Pierce Middle School and Ananya Mudigonda from Fugett Middle School did a wonderful job and were recognized for their hard work and dedication. Contestants were also judged on Best Costume and Liam Mullin won that award. Cash prizes and certificates were presented to all. Judges included Dr. John Noakes, Ms. Kelley Meagher, and Dr. Kate Shaw. Bob Gross, who founded the event and acted as Master of Ceremonies, gave each student finalist a large Lincoln coin engraved with the Gettysburg Address. A representative from State Senator Andy Dinniman’s office also presented each contestant with a certificate, and Representative Carolyn Committa was present to congratulate each contestant and recognize Joe Martino for the contests 20th year. Original winner from 1998, Mariette Yost Chow, also attended the event in commemoration of this milestone. The Community Foundation offers a thank you all the students, teachers, parents, judges and schools for supporting this event. The 2018 program was generously sponsored by Top Hat Champion, Delphi Wealth Management Group. Other sponsors include DNB First Wealth Management for the 1st Prize and Friends of Andy Dinniman; Friends of Carolyn T. Comitta; McFadden Hotel Group; Team Jean Homes; WhirlAway Travel & Cruise; and Zukin Realty. The event was hosted and promoted by the Chester County Community Foundation. 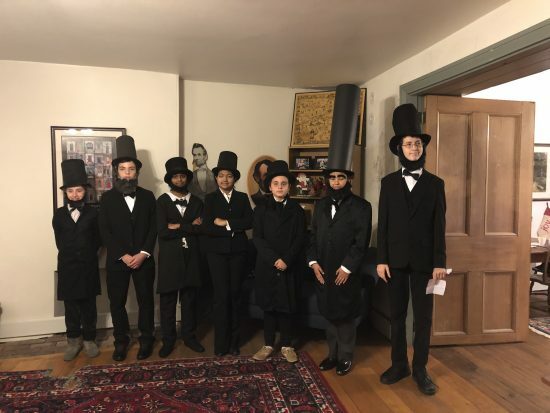 The Little Lincoln Gettysburg Address contest encourages youth, families, and friends to become involved in their community and encourages an awareness of local history and events that have shaped our nation. Photo Caption (bottom): Liam Mullin pictured while delivering speech from Lincoln Balcony. Liam won third place in the competition. « Whitford Charitable Fund Spreads Generous Holiday Cheer!